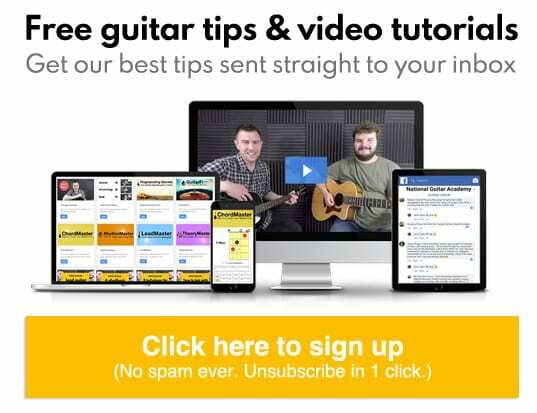 Looking for some fingerstyle guitar lessons? Let’s get started! The basics of fingerstyle technique. 12 awesome exercises to get your fingers dancing around the strings. How to use your thumb, first finger and second finger for fingerstyle. How to apply fingerstyle technique to basic chords. Fingerstyle technique is an awesome way to add texture and nuance to your guitar playing and is used by tons of different guitar players. A classic beginner mistake is trying to use too many fingers to learn fingerstyle and fingerpicking. In this lesson we are only going to be using our thumb, first finger and second finger. That’s all. We can cover a lot of ground with just these three fingers. Where Do I Place My Picking Hand? Your hand should be roughly above the sound hole, with your thumb pointing towards the headstock and your fingers just below it above the strings. Where Do I Place My Fingers On The Guitar? To start with it’s good to have a rule in place for where we’re going to place our fingers. The majority of the time your thumb will mainly be playing the thicker E, A and D strings. Your first finger and second finger will cover the thinner G, B and high E strings. What About The Rest Of My Fingers? The fingers you currently have left are your third and fourth fingers. There are a few things you can to do with these to help you with this classic technique. One technique which a lot of players use is an anchoring technique, this is where you use your guitar’s body as a platform to anchor your fingers. Place your 3rd and 4th fingers on the guitar’s body and try it. This can help with balance. This is a great technique as it helps you balance between the fingers you’re using on the strings and the fingers you’re not using! However your fingers may not stretch this far and it just feels too weird for some people, which is why so many guitarists simply HOVER. Even though hovering your fingers can be harder than anchoring them, it can be useful because it means your 3rd and 4th fingers can be used to play extra strings. Ultimately you have to find what’s best & most comfortable for you so experiment with both these positions and see what feels right. It’s important we get used to the motion of moving our fingers across the strings. In this first exercise we are going to go between the Low E string, A string and D string using our thumb, first finger and second finger one after the other. Notice how in the tab there are letters above the tab. All this means is what fingers you use. This may seem very simple, but this is a fundamental exercise and picking pattern for all aspects of fingerstyle guitar. Practice this pattern again and again using different chords shapes and see how it sounds. Action point: Bounce back and forth between Em and G using this pattern. The thumb is often neglected by guitar players but it can be an incredibly useful tool for a guitarist. Using the thumb adds a softer texture to the guitar and can add a lot of dynamic range to your playing. 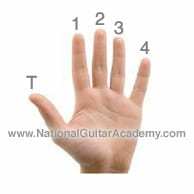 Before we get started let’s pick a chord that we can use throughout all these fingerstyle guitar lessons. Let’s go with E Major. A fabulous fingerpicking chord as it’s big, bold and we can play all 6 strings. If you don’t understand how to read chordboxes, read this article of ours. 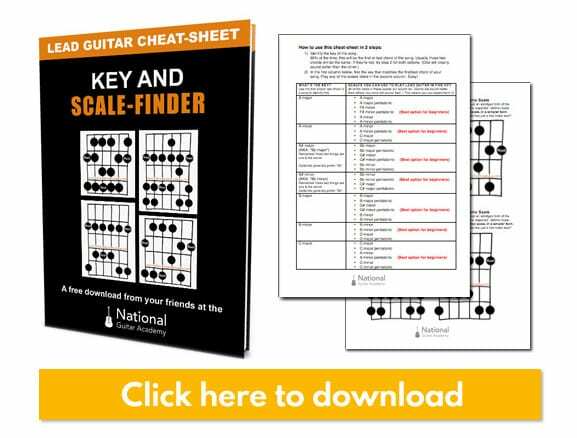 We won’t be using any other chords in these fingerstyle guitar lessons, so make sure you have a good grip of this. Firstly we’re going to start off with something nice and simple. All we’re going to do is alternate between the the low E string and the A string. This is really great is at gets the thumb moving across two strings and is a classic fingerstyle technique. Note: We are only using the thumb here. Now we’re going to strum with our thumb. This can add a soft texture. The second exercise we’re going to look at is to add some bass notes to our strumming pattern. So this time, we’re going to use our thumb to play the E and A strings separately. Whilst in between these notes, we’re going to strum the chord. Now let’s take a look at using our thumb and our first finger together, adding in the extra finger can be tricky, but don’t worry we’re going to go through a bunch of exercises which will help you tackle this essential technique. This is classic fingerstyle technique, used in thousands of folk & country songs. To begin with we’re going to get used to the idea of the thumb and first finger being completely independent of each other. To do this we’ll be individually picking each string with the thumb and first finger. Our E, A and D string will be picked with our thumb. Our G, B and E string will be picked with our first finger. The second exercise we’re going to do has some string skipping in it, this is a unique technique and can add a cool texture to chords. This style of finger picking is great as it can often make your basic chords sound completely different! This time we’re going to skip out the middle string. The string pattern will go like this. E string: thumb, D string: first finger. A string: thumb, G string: first finger. D string: thumb, B string: first finger. G string: thumb, E string: first finger. This exercise uses the first finger differently. We’re actually going to use our first finger as a pick, whilst our thumb changes bass notes. Again, this is another classic piece of fingerstyle technique. When we use our first finger, we’re going to use our nail to strum the rest of the strings. This works best with a downward strum towards the floor. E string: thumb, first finger: strum top three strings. A string: thumb, first finger: strum top three strings. Now we’ve gotten used to the idea of using your thumb and first finger together, let’s add in our second finger. This is a big step. Take your time. Be content to just play using your thumb and first finger for a while, adding your second finger as a ‘bonus’ every now and then. Adding in an extra finger adds all sorts of possibilities and can create a LOT of interesting patterns. We’re going to look at three different exercises to get your finger picking chops up to scratch. Now we’re getting into pro-sounding fingerstyle technique. So cool! Our pattern is going to like this. Low E string: thumb, G string (first finger) and B string (second finger) plucked at the same time. A string: thumb, G string (first finger) and B string (second finger) plucked at the same time. D string: thumb, G string (first finger) and B string (second finger) plucked at the same time. The second exercise we’re going to look at is really simple. We’re going to be alternating our first and second finger between the B and high E string, whilst our thumb changes the bass note. Again, this is heard frequently in folk and country music and sounds fantastic. It’s also a great exercise to keep the first and second fingers warmed up. Our pattern goes like this. E string: thumb, B string:first finger, E string: second finger. A string: thumb, B string:first finger, E string: second finger. D string: thumb, B string:first finger, E string: second finger. This last exercise is a bit of a finger twister, so make sure you go slow when attempting this! We are going to be finger picking each string and descending down each string as we go. So our pattern will be something like this. E string: thumb, D string:first finger and G string: second finger. A string: thumb, G string:first finger and B string: second finger. D string: thumb, B string:first finger and E string:second finger. The final thing we’re going to look at is a technique which I think is often overlooked by many guitar players, however it is used frequently throughout acoustic-based music. The “claw” uses your thumb, first finger and second finger together to play several notes of the chord at the same time. Where as the “mute” is used as a percussive technique to stop the chord altogether, this sounds useless on it’s own but can create unique textures when combined with the “claw”. Now we know what these techniques are, let’s get into some exercises which utilise them. This first exercise is going to use our thumb, first finger and second finger, whilst we pluck each string at the same time. It’s designed to create unique textures to chords, as opposed to strumming the whole chord. By using certain fingers we can create sounds which would be hard to create using a pick. Use our thumb on the low E string. Use our first finger on the G string. Use our second finger on the B string. Pluck all strings at the same time! You don’t have to use these specific strings either, you can experiment with using different combinations of strings. In this exercise we’re going to specifically look at muting the strings after we’ve played them. Firstly, strum your E chord. Place your hand on the strings after you’ve played the chord. You should be muting with the lower palm of your hand. This will stop the sound of your strings almost instantly, as well as creating a cool percussive sound to your guitar playing. Even though it’s a simple technique, it’s used frequently in fingerstyle playing and helps to cool and interesting sounds. The final exercise we’re going to look is a combination of the two. This time we’re going to add some rhythm to our playing, as well using this cool technique. Thumb on the low E string. Second finger on the B string. Pluck the strings at the same time! This time we’re going to add some rhythm to our chord, as well as muting it after. Here’s what it looks like on the tab.